Aerostar Aircraft Corporation was formed in 1991 by its principals, Steve Speer and Jim Christy. Aerostar Aircraft Corporation is planning in the future to produce both a Jet and a Turboprop version of the Aerostar. Before co-founding Aerostar Aircraft Corporation, Mr. Speer held engineering positions with Ted Smith Aerostar, Boeing Company, Aerojet Manufacturing Company, and the Navy's Pacific Missile Range. 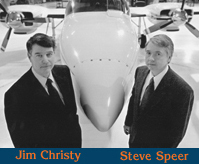 Before co-founding Aerostar Aircraft Corporation, Mr. Christy held positions in customer service, sales, and sales management with Ted Smith Aerostar Corporation, Piper, and with Aerostar dealers. The Aerostar series of aircraft was originally conceived by Ted R. Smith, one of the most brilliant aircraft designers of all time. Arguably, no one has had as great an impact on general/business aviation as Ted Smith. Each aircraft design credited to his name helped set new standards for future designs. It is not widely known, but Mr. Smith designed, certified, and built the first all new small twin engine business aircraft, the Aero Commander. He then brought the first small business jet aircraft to market which was the Jet Commander now evolved into the Astra Jet. Mr. Smith, more designer than promoter, was know as the "quiet man", letting his revolutionary aircraft designs, with their spectacular performance, speak for themselves. The Aerostar family of aircraft was the culmination of 40 years aviation experience and expertise, and included the design concepts and engineering. The design work for the Aerostar was begun by the Ted Smith Aircraft Company in November 1964, with the first model 600/601 prototype flying in October 1967. Certification was in March 1968 for the 600 and November 1968 for the 601. Additionally, two more certificates were obtained. These were for the use of 180-hp and 200-hp engines, called the Models 360 and 400 respectively. After certification, controlling interest in the company was sold to American Cement. In 1970 American Cement sold the firm to Butler Aviation, but little was done until 1973, when Smith resumed control and started production in Santa Maria, California, on both the normally aspirated 600A and the turbo 601A. On August 6, 1975, and Aerostar 601A, piloted by Jack Chrysler, set a class C1d, 2000-kilometer, closed-circuit speed record for piston-powered land-planes at 237.08 knots (272.83 mph). Between November 4 and 9, 1977, an Aerostar 601P piloted by Philander Claxton III and Jack Cink recorded a new round-the-world speed record for piston-engine aircraft. The 19,974-n.m. (23,000-s.m.) trip was completed in 104 hours, 5 minutes and 30 seconds, averaging 190.91 knots (219.70 mph). In 1976 Smith died, and Piper Aircraft soon took over the Aerostar line, eventually moving production to Vero Beach, Florida. On February 14, 1981, Piper announced the Model 602P and named it the Sequoia. This pressurized plane had Avco Lycoming IO-540-AA1A5 low-compression engines with integral turbochargers. The name was later withdrawn. Smith had been with Douglas Aircraft and designed the A-20, a low-level attack bomber for the military in World War II. 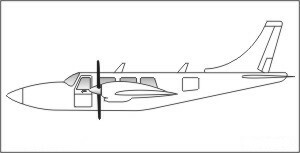 Later he designed the Aero Commander twins for the civilian market. In 1963, when Rockwell decided not to pursue any new development other then the Jet Commander, Smith took six months off to mull over his future. He said that while skiing the slopes of the Lake Tahoe area, he would develop concepts of a new plane and then put them on paper at night. The result was the Aerostar. Part of Smith's concept was commonality and a reduction in parts. Commonality was achieved by the use of the same parts for the rudder and elevator, and the horizontal and vertical stabilizers. This was a first for the industry. Simplicity and production design were also a major effort. But there was a goal other than just a simpler airplane. Smith wanted the plane to be adaptable to a range of power sources, from a single-engine to "a pure turbine-powered, 500-mph airplane." His idea was to put as much of the heavy and beefy equipment on the outside to use it for structural strength. One such way was the elimination of many pieces of under-structure and substitution of heavier-gauge skins (0.050 inches, twice the normal wing-skin thickness). This made the skin carry more of the bending, torsion and shear loads. Smith said there are 50 percent fewer model-specific parts in the Aerostar than in competitive types. These understructure alternations and heavier skins gave the plane a rigid structure that directly relates to a high dynamic factor. Smith said that as such, the plane, as it's built, can be flown at true airspeeds of 800 mph without getting into the flutter parameters. He also said the plane has been flown at altitude, with power and in a slight decent, at 500 mph true. Statically, the plane was tested to 6000 pounds gross and an ultimate load factor of 6 Gs with no deformations, no permanent sets, no cracks and no failures of any kind. Additionally, the load was held for an indefinite period of time at this ultimate load factor. The FAA requires a hold of five seconds, but "...since nothing was happening, we just kept the load on for an indefinite period of time, then relieved the load, and the airplane came back to its normal status as it was before the load was first applied." He also said that strain tests showed the plane could double its gross weight with nothing more than minimal structural changes. Before we get too far along, let's address the issue of the plane's reputation. As with all planes and people, there will be stories about the good and bad points. When I mentioned to some friends that we were going to do this story, I was regaled with stories about the plane falling out of the sky. Asking Jim Christy, Aerostar's vice president, about this, he said the story originated with stall tests. A test pilot took the plane and ran a series of stalls, involving 90 percent power and the plane in a dirty configuration. At about 64 knots, which is way below Vmc, the plane's wing was flying, but the rudder lost effectiveness. The next things to go were the ailerons, but the wing was still flying - just the opposite of what's desirable. 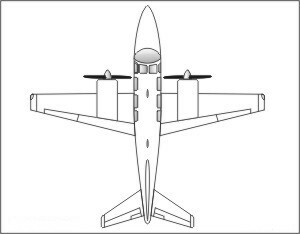 Up front, the ailerons are a Frise design, in which a small portion of the surface sticks down into the airflow when the aileron is rotated up. When rotated down, the surface between the wing and the aileron is smooth. This is designed to counteract adverse yaw. At slow speed and maximum deflection, the aileron on one side of the plane would stall. Therefore, vortex generators have been installed on the bottom of the wing. Subsequent testing has shown that the plane can be controlled, completely stalled with full flaps and 90 percent power, within 15 degrees of roll and yaw, at 52 knots, while descending at 4000 fpm. 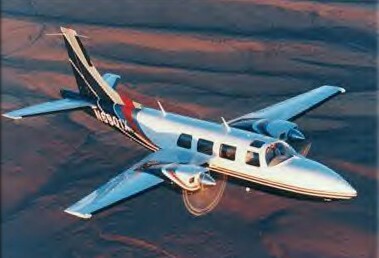 Through the 1970s, Piper continued to modify and improve the Aerostar line and announced the addition of the PA-60-700P, called the Aerostar 700P, to the line on November 20, 1982. 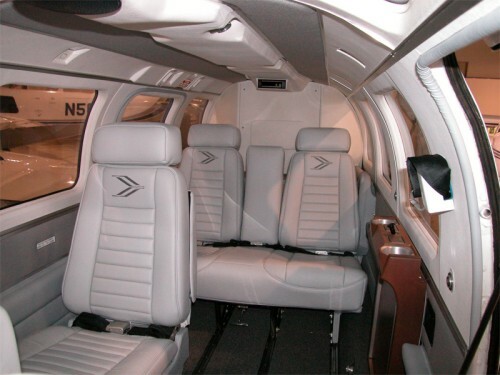 Design on the 700P, by Piper, had started in January 1981, with prototype construction initiated six months later. The first flight was in September 1981, and production began in December 1982. FAR Part 23 Amendment 6 certification was received in May 1983, and the first customer delivery was in December 1983. The model was also certified for flight into known icing. Only 25 of these planes were built. Prior to that, however, in 1980 Machen started producing an upgraded version of the Aerostar 601P. Called the Superstar II, or Super 700, its engines were replaced by TIO-540 engines with Garrett TA-18 turbochargers and induction air intercoolers, each rated at 350 horsepower and driving a Hartzell three-blade propeller. Robyn Astaire's plane, N40X, was a Piper-built 602P that was transformed into a Super 700 Aerostar by Aerostar Aircraft/Machen Inc. The Piper version, if indeed there was nay difference at all, of the Model 700 sported a pair of intercooled, flat-six, counter-rotating, 350-hp Lycomings, TIO-540-U2A engines. The plane's cruise speed increased to a reported 261 knots (mid-cruise weight and optimal altitude), with enough capacity in the turbo system to maintain power and cabin pressure to 25,000 feet. The single-engine ceiling is 16,500 feet, which will get you over all the dirt here in the lower 48. But the power plants are only part of the picture, as we were to discover upon examining Astair's 700P. Shining in the sunlight, the plane's paint scheme is tastefully designed. In fact, Astaire is so proud of the design, she said there's a design patent on the colour and scheme. While the fuselage's breadth appears to be small, the interior is surprisingly commodious. Entry to all the seats is through a clamshell-type door located at the pilot's seat. With the pilot's seat all the way forward, entry is easily accomplished. Putting the only door at the pilot's elbow takes the term "a pilot's plane" to a new level, especially in an emergency. Lest anyone think this callous, there's an emergency exit above the wing on the starboard side. Astaire's plane is as luxurious as one could imagine, with leather, carpeting and a tastefully done decor. Her seating arrangement is a pilot, copilot (not required) and up to four passenger seats with a centre aisle. Once inside and ensconced in the copilot's seat, I found all the instruments easily within view - and there were quite a few items to see. 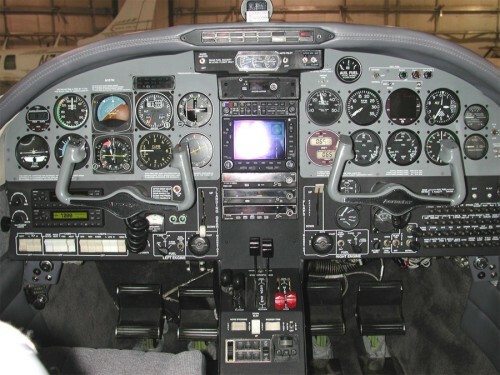 The almost entirely King avionics assembly includes a pair of KY196 coms, two KNS 81 RNAV receivers, a KLN 88 loran, a Trimble 2000 GPS (used for IFR approaches), a KN 64 ADF, all of which are feeding into a color King EFIS centrally mounted in front of the pilot seat. To round things out, there's a cluster of JPI engine instruments on the right sidewall. We bemoaned the fact that we weren't able to view all this at night, because Astaire said the colours on the panel are outstanding. With the introduction of the FJ 100 jet project, the company is moving into another market. Certification has not yet taken place and investment is being sought.